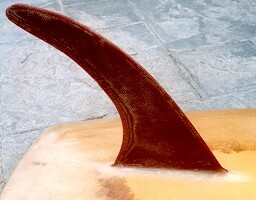 1967 Gordon Woods, Stringerless Wide tail 8 ft 7"
Bottom: flat, round, soft round. Deck: Gordon Woods blue/green/red psychedelic script at left, forward sweet spot. Bottom: 7009 -pencil at tail, behind fin. The second 0 is obsured and is a best guess. A brief design phase, note wide tail and chamfered pod, direct precedent to the Vee Bottom, mid-1967..